The new Lamborghini 'Urus' SUV was unveiled Monday, Dec. 4, 2017. Supercar makers have long known that parked next to that snarling Lamborghini, a racing-red Ferrari, or stately Bentley at some of the globe's toniest addresses is a practical SUV. With the sport utility vehicle market growing by leaps and bounds, they increasingly want in on the profits. 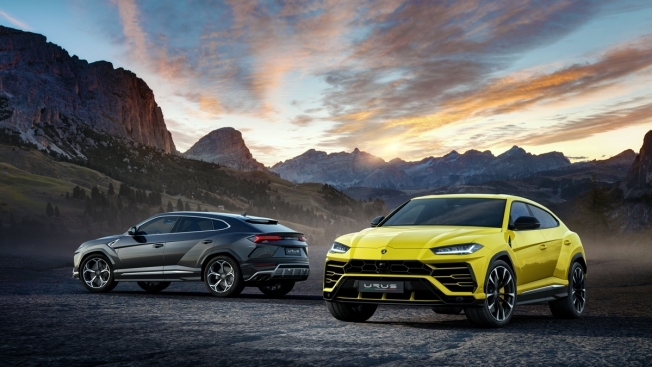 Lamborghini unveiled the once-improbable Urus SUV on Monday at its headquarters in Sant'Agata, Italy, where the supercar maker owned by the Volkswagen group is expanding the factory to meet utility vehicle demand. "I wanted a double-Lamborghini garage," Charalambous said, growing impatient while a technical glitch delayed the unveiling ceremony on the Sant'Agata factory floor. "I have always had a four-by-four. And I have always had a Lamborghini," the Londoner said. "I have had Range Rovers. I wanted something different." Lamborghini dabbled in the SUV market in the 1980s and 1990s with the boxy LM 002, which sported a body shape not all that different from the Hummer's. But the Hummer's lower price was hard to beat. Lamborghini ended up only building a few hundred of the LM 002. "Now we live in a different world," John Giunta, a Lamborghini dealer in Sarasota, Florida, said. "The lines of this is more modernized, and something of this price point can survive now." The Urus can go from 0 to 100 kilometers per hour (62 mph) in 3.6 seconds and brake from 100 kilometers an hour to a stop in 33.7 meters (111 feet.) At a maximum speed of 305 kilometers an hour (189.5 mph), Lamborghini boasts that it is "the fastest SUV in the world." "I think if you look at those brands' image, I think you would look at an SUV — especially a Lamborghini — as almost a sell-out move. I don't think that is the case anymore," Jeff Schuster, senior vice president at LMC Automotive in Detroit. The entry of the Urus along with the planned Aston Martin DBX and Rolls Royce "High Side Vehicle" is expected to push those numbers up to 29,300 by 2020. "A lot of manufacturers said, 'Oh, we can have a piece of that,'" Fletcher said. "This is going to sell very well," said John Littlefield, who owns Lamborghini Carolinas dealership in Greensboro, North Carolina. "I owned one of the old LM 002....The LM 002 was a beast. This is more refined luxury and beast."